Gold trading among existing private investors rebounded as bullion prices steadied in November, but new interest from first-time buyers sank to its lowest since the metal’s bear-market price lows of 2015. That pulled the Gold Investor Index lower to 53.9 from October’s reading of 54.6 according to new data today from BullionVault, the world’s largest online marketplace for physical precious metals. Internet searches for ‘buy Bitcoin’ meanwhile further overtook the phrase ‘buy gold’ last month as the crypto-currency jumped to new all-time historic highs above $11,000. Gold trading on BullionVault rose 30.5% by volume last month from October. Across November as a whole, clients of the West London-based fintech specialists added 100 kilograms of gold to their holdings overall. That took total client gold holdings back above 38.0 tonnes, within 0.2% of July’s all-time peak. 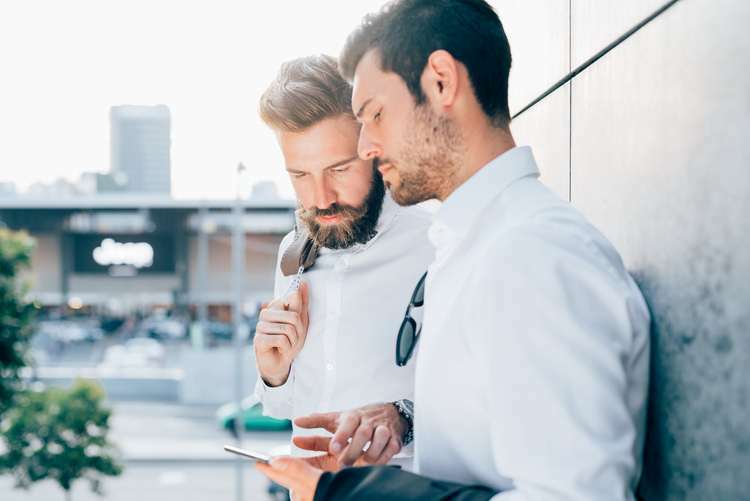 But the number of new first-time investors fell again, recording its lowest monthly level on BullionVault since December 2015, when gold, silver and platinum prices hit five, six and seven-year lows respectively before turning sharply higher. Over the last 12 months, the number of first-time precious metal investors has now fallen by 20.1% compared to the previous half-decade. Only Germany is ahead of its 5-year average among BullionVault’s top 10 markets, with the number of new users from the Eurozone’s largest economy rising 10.5% in the 12 months to November 2017. “Whether or not Bitcoin ever achieves common use as money, the crypto-currency plainly offers investors a hot speculation and not a safe haven right now. Bitcoin’s fresh record highs have come alongside new historic highs in the stock market, led by stretched valuations in tech shares. The ultimate investment insurance of physical gold in contrast is trading flat in line with its 5-year average. Worldwide, the number of BullionVault users starting or growing their gold holdings in November was little changed from the month before, down 2.6% from October. The number of sellers in contrast rose 22.5% from October’s 23-month low as prices edged higher on a month-average basis against all major currencies. 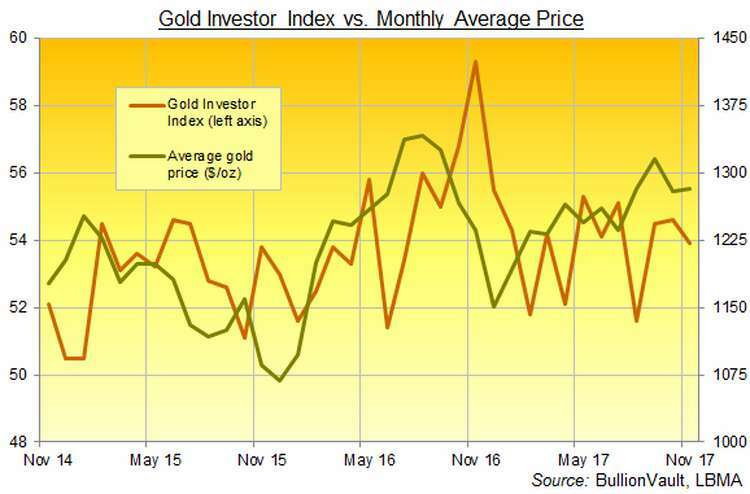 That saw the Gold Investor Index retreat to 53.6 from October’s 54.6 reading – then a 3-month high – to mark the 10th month of 11 so far in 2017 that BullionVault’s sentiment measure has moved inversely to prices. Tracking only genuine buying and selling among private investors, the Gold Investor Index hit a record 71.7 in September 2011, peaking with the gold price. It would read 50.0 if the number of buyers exactly balanced the number of sellers across the month. The number of silver buyers meantime rose 8.8% last month from October’s 29-month low as prices edged higher. The number of sellers jumped 26.9%. 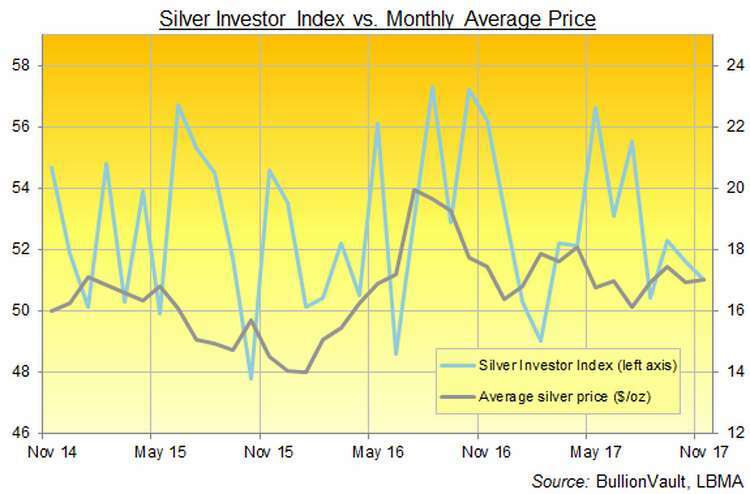 That pushed the Silver Investor Index down to 51.0 from October’s 51.6 reading, marking the 9th time in the first 11 months of 2017 that this sentiment measure moved in the opposite direction to silver prices. By weight, total client silver holdings stayed unchanged for a third month running, holding at a record 689 tonnes.